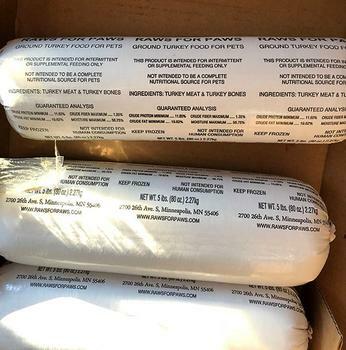 Raws for Paws of Minneapolis, Minn., is recalling approximately 4,000 pounds of its 5-lb. and 1-lb. chubs of Ground Turkey Pet Food. The recalled product is packaged into 1-pound and 5-pound sealed plastic tubes, also known as chubs. The chubs are packaged into regular Turkey Pet Food cases and Pet Food Combo Pack cases, which contain a variety of pet food products. The recalled product has case codes of 9900008, 9900009, 9900014, and 9900015. The manufacture date of Turkey Pet Food cases is 10/12/2017, and the manufacture dates of Combo Pack cases are between 10/12/2017 and 2/2/2018. The recalled product was sold throughout Minnesota, Wisconsin, and Iowa directly to consumers, and through online mail orders. Customers who purchased the recalled product should stop using it and contact Raws for Paws to determine if their product is subject to this recall, and for more information about disposal or return instructions. Consumers with questions may contact the company at 612-465-0372.